The story of Ann Maria Kalippilaanu revolves around a vibrant and jovial kid named Ann Maria. Things take a turn when she witnesses certain events that happen in her school, which leaves her disturbed. It is then that Poombatta Gireesh enters the scene and the rest of the happenings form Ann Maria Kalippilaanu. Ann Maria Kalippilaanu is a light-hearted feel-good entertainer in all the senses. The film won't make you bored at any point of time and there are some moments laced with simple humour which are genuinely enjoyable. The makers have made it a point to convince the viewers about the storyline and happenings. Where Ann Maria Kalippilaanu scores heavily is in its narrative pattern. The director has employed an interesting narrative pattern taking us through the life of Ann Maria through different characters in the film. Ann Maria Kalippilaanu is a genuine feel-good movie with some good moments to offer to the audiences. The film won't disappoint you as it has been freshly packaged by Midhun Manuel Thomas. Dulquer Salmaan Is Back With A Cameo Role! Children's Day Special! A Year Filled With Children Based Malayalam Films! 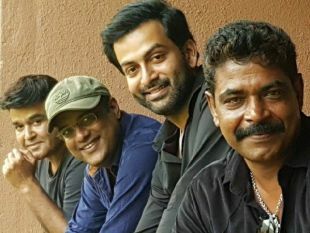 Midhun Manuel Thomas And Sunny Wayne To Team Up Once Again For Alamara!